Dorothea Benton Frank is a New York Times bestselling author who’s written more than a dozen novels set in her native South Carolina, beginning with 2000’s Sullivans Island and including 2012’s Porch Lights and last year’s All the Single Ladies. Her latest, All Summer Long, tells the tale of Northerner Olivia Richie, an interior designer planning to move to the South Carolina Lowcountry with her Southern second husband, Nicholas Seymour. It will be an adjustment: “A bona-fide New Yorker, Olivia didn’t give one tiny damn about when she wore white. She had her own rules.” Over the course of the novel, they also travel to such places as Nantucket, Massachusetts; Palma, Spain; and the exclusive Necker Island in the Caribbean. I recently asked Frank about the new novel. 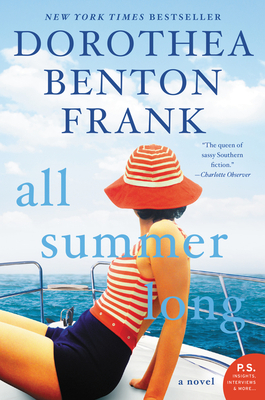 All Summer Long features a New Yorker as its main character, who’s transplanted to South Carolina. The differences between the two locales is a running theme throughout the book. Porch Lights also features a New York resident who’s torn about moving to Sullivans Island. You’re a South Carolina native who’s lived in New York area for many years. How did your own experience inform how you wrote these characters? That’s a really good question. My book Porch Lights has a character who lived in New York, who was an Army nurse who wound up living in Charleston—her mother lives there, so she was a very different kind of character. I wrote that story, oddly enough, because I have a really fabulous relationship with my daughter, who’s 30 and actually writing her own first book now. I was wondering what it would be like if you had a daughter who was the total opposite of you, who you were really not close with, and that was how that story started. This one, All Summer Long, is once again loosely based around the truth of my life. My husband and I plan to retire to Charleston….He is so nervous to move to Charleston, South Carolina, because he’s an investment banker and a very Type-A personality, and I think the change in the pace is going to drive him crazy. So I wanted to look at that a little bit. I’m really Nicholas Seymour [in the book], you see, and he’s Olivia. In the acknowledgements, you note that several characters are named after real people who had made charitable donations. How did that come about? Many times I’m asked to speak at different kinds of events—Breast Cancer Awareness Month, battered women’s shelter fundraisers, library fundraisers….and they always have some kind of silent auction or raffle, that sort of thing. So I always donate the chance to be a character in a book. Immortality at your fingertips!...I think it’s really fun to find your name in a story as a character. It has nothing to do with you, and doesn’t resemble you at all, but there’s your name every 10 pages. Speaking of fans, you hosted a ticketed event for them in 2014: the Dorothea Benton Frank Fanfest, which featured a walking tour of Charleston, a cooking demonstration, a visit to Sullivans Island, and a book signing. Do you have plans to host another one? I definitely want to have another Fanfest. I’d like to do another one in Charleston for people who didn’t get to come on that one, because that one sold out in, like, three days…. I was really nervous that nobody would want to come at all! Kathy Gordon [at William Morrow] is the one who planned it, and she thought it was going to be huge, [but] I was stunned, I really was. I would love to do it again for people who were stuck on a waitlist, and I’d like to maybe go somewhere else, like Napa, and maybe learn about wine together, or New York City….My readers, I wouldn’t mind living next door to them. They come to my signings, they bring me cookies, and they say, “How do you do it? You must be so tired, you poor thing!” They’re just really nice women. All Summer Long isn’t just centered in South Carolina, like your other novels. The characters go to New York, Majorca, Nantucket, Necker Island. Have you been to all these places? I have not been to Necker Island….But I know these things exist. Through the miracle of the internet, you can go almost anyplace and learn [about] the places. If you just Google “playgrounds of the rich and famous,” all these things start popping up, and it’s such fun to look at them. One of the characters, I think it’s Nicholas Seymour, talks about his friend Bob, who’s going to take him to this fabulous hotel that’s in the Fiji Islands or someplace, where it’s completely underwater and you lie on your bed and watch dolphins swim by. That place really exists. There are some crazy things out there you can spend your money on…. This is meant to be a fun book. This particular book, there are some sort of serious issues in there about aging, and whether money buys you happiness. But basically, this year, I wanted to give my readers a really super-entertaining, crazy, over-the-top kind of story. I think it’s just pure fun, and you actually do learn about some fashionable places and things, as a little take-away.